Graceful and elegant, these gorgeous 0.63" gold hoop earrings exude charm and refinement through the prestigious sheen of 14K gold and luxurious brilliance of diamond stones that weigh 0.50 ctw in total. 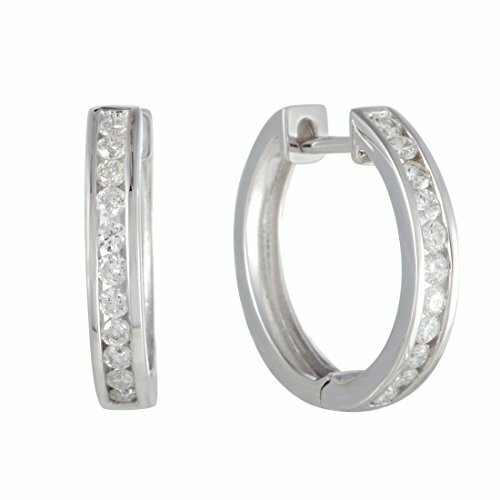 These stylish 14K white gold channel diamond hoop earrings feature a 1/2 carat of brilliant diamonds for sparkling brilliance. If you have any questions about this product by Luxury Bazaar, contact us by completing and submitting the form below. If you are looking for a specif part number, please include it with your message.